There’s more to laser surgery than meets the eye – meaning that there’s more to surgical lasers than vision correction. For instance, lasers are used to treat throat cancer, to remove excess prostate tissue and to remodel cells. These advances are due to laser developments, the creation of new tools and a bit of luck. But more innovation is needed in lasers and other technologies. It’s not laser surgery in the traditional sense, but a product from McKinney, Texas-based Erchonia Medical illustrates a class of applications where tissue isn’t ablated or removed, as might be the case when a laser replaces a scalpel. Instead, tissue is reconfigured. In the case of Erchonia, this is done by applying light to fat sitting a few millimeters below the skin. The result is that cells are temporarily changed. “It’s a transient manipulation of the protective barrier of the cell, and that simply provides a passageway for the fatty material to be eliminated,” said Ryan Maloney, the company’s chief research officer. He added that histological studies have shown that the treated cells remain viable. The fat in them leaves, thereby accomplishing what has traditionally been done mechanically and by other means during liposuction. Treatment requires several visits over a period of a few weeks. Last August, Erchonia Medical’s device as a stand-alone application received FDA clearance for circumferential reduction of the waist, hips and thighs. 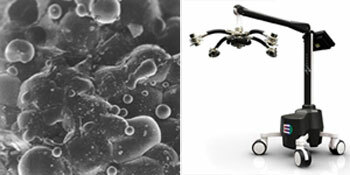 Low-level laser light from an FDA-approved system (at left) alters cell membranes, causing fat to leave and fat cells to deflate. Courtesy of Erchonia Medical. The company accomplishes this with a low-level 635-nm laser, with the system outputting, at most, 20 mW of power. The mechanism behind the effect is thought to arise from an interaction of light with cellular mitochondria. Low-level laser light has been used for a long time as a treatment for pain. It was a fortuitous application of such a treatment immediately prior to liposuction that led to the observation of the fat-melting effect, Maloney said. Of course, fat that can be seen isn’t the only type in the body. Other fatty compounds, notably cholesterol and triglycerides, circulate in the bloodstream. An estimated 35.7 million US adults have high-risk cholesterol levels, according to the American Heart Association. As a result, tens of millions of prescriptions for cholesterol-lowering drugs are filled every year. However, studies on statins, the most popular class of cholesterol-controlling drugs, have shown that up to 1.4 percent of people stop taking them due to side effects. The company is investigating this possible treatment, even though the approach will have its limits. For one thing, the laser penetrates the skin only to a depth of 4 mm, and so much of the circulatory system will remain out of reach. Still, the technique could be a useful addition to a clinician’s toolbox. Of course, laser surgery in the more traditional sense has also been making strides. 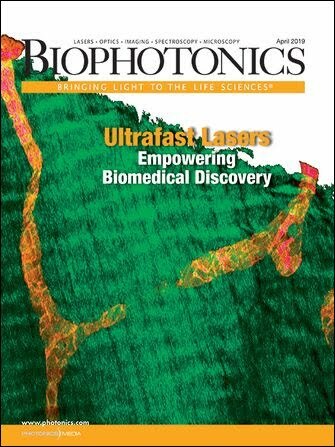 The advent of new laser-based techniques has had a significant impact on the treatment and reduction of an enlarged prostate, or benign prostatic hyperplasia, as well as on the ability to destroy kidney stones, for example. Because the laser delivers energy at precise locations through a flexible optical fiber, it enables surgeons to provide such treatments in a minimally invasive way. Typical laser surgery operating room setup with video monitors and jet ventilation. Courtesy of Dr. Paul Castellanos, University of Alabama at Birmingham. This can be done with a KTP laser, which uses a crystal to create a 532-nm green beam from a 1.06-µm Nd:YAG laser. Another approach involves a holmium laser operating in the infrared at 2.1 µm. This can be combined with an Nd:YAG in a single system. One company that offers all of these products is medical laser system maker Lumenis Ltd. of Yokneam, Israel. Paul Castellanos, associate professor of laryngology and bronchoesophagology at the University of Alabama at Birmingham, has seen what lasers can do in transoral microsurgery. Working with a scanning CO2 laser operating at 10.6 μm, he can remove tissue precisely. Because the beam provides a brief burst of energy, it vaporizes tissue, and the resulting plume rapidly removes heat, limiting damage to a depth of 25 μm instead of the up to 500 μm produced by other lasers. To illustrate what this degree of control means for a surgeon, he talked about using such a system on the back of the hand, and the impact of that removal process on the blood vessels that run just below the surface. Laser surgery can be used to remove a benign tumor or to preserve a larynx and voice. A patient had an obstructed airway due to a venous hemangioma of the larynx – a benign tumor rich in blood vessels. Using a combination of a scanning CO2 and a dual-wave Ho:YAG laser, surgeon Paul Castellanos removed the tumor, losing perhaps 5 cc of blood. This avoided the need for an incision and a tube and left a functional larynx and voice. Courtesy of Paul Castellanos, University of Alabama at Birmingham. “You can take the skin off of the vessel and the next layer of tissue and the next layer, probably 10 or 12 passes, removing a millimeter by three millimeters rectangle of tissue before you go through that vessel wall,” Castellanos said. As a result, surgeons can remove diseased tissue while preserving almost everything that is healthy. That can be a significant benefit, particularly if reconstruction is the goal. Castellanos noted, though, that a scanning CO2 laser-based system wouldn’t work in all situations. In particular, current technology is line-of-sight, making it difficult to reach locations that require going around a bend. Being able to deliver a tightly focused pulse of light down a fiber and around a fold of tissue would be beneficial. So, too, would being able to quickly switch between wavelengths so as to differentially target hemoglobin and other chromophores. Advances in fibers and fiber lasers could make such systems possible. There also have to be improvements in robotics because putting such accuracy to use requires better-than-human capabilities. 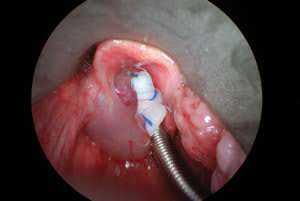 For instance, Castellanos uses a system that combines an operating microscope, a scanning laser and robotic beam control, allowing him to determine incision length, ablation area and penetration depth during a procedure. 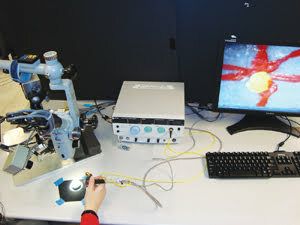 Prototype of a semiautomated intraocular laser system, which can improve surgical accuracy and speed. Courtesy of Cameron Riviere, Carnegie Mellon University. 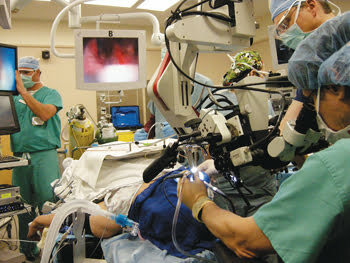 The surgeon still has to set the overall parameters of any operation. Robotics just makes procedures faster and more accurate. An example of how this might work can be seen in a project being carried out at Pittsburgh-based Carnegie Mellon University. Medical Instrumentation Laboratory director and associate research professor Cameron Riviere has been heading up the development of semiautomated intraocular laser surgery instruments. These will be used when eye surgeons perform laser retinal photocoagulation, which can involve making hundreds of dotlike laser burns. This procedure can be used to combat disease-driven unhealthy blood vessel growth. It also can be used to seal off a retinal tear and prevent it from spreading. Riviere pictures surgeons handling the gross motion of the device, sweeping it back and forth over an area much like mowing a lawn, while the system, once perfected, would handle the fine movements. “Whenever it senses that it’s within reach of a designated target spot that has not already been treated, the tool snaps over to that target, fires the laser, and then it snaps back to its null position,” Riviere said of the prototype. Tests described in a March 2010 Lasers in Surgery and Medicine paper have shown that this approach makes dot placement more accurate, with an overall mean error reduction of about 20 percent compared to that of a skilled surgeon’s unaided method. Also, the mean error with the robotic aid remained about 125 μm, even as the sweep rate quadrupled from 0.5 to 2.0 Hz. Thus, the technology could improve accuracy and speed. With regard to the laser, the semiautomated approach is agnostic, but it does require that the light be delivered via a flexible fiber or waveguide. That’s because the tool literally demands wiggle room. Riviere is working with an industrial partner to commercialize the technology in general, with no announced product development schedule. He noted that the rapid, fine movement of the system does take some getting used to for a surgeon. Finally, there are aspects of laser surgery that revolve around what happens after or before a procedure, or what might happen even when no tissue is removed. Lasers have a role to play here as well. Raymond Lanzafame is a general surgeon in private practice in Rochester, N.Y. He has been active in the American Society for Laser Medicine & Surgery for some time and also has been involved for years in laser-based photobiomodulation research, investigating how light can be used to promote wound healing and other therapies. He has also taken part in a study on how lasers can be used to treat toenail fungus, a generally progressive ailment that affects tens of millions in the US and hundreds of millions worldwide. There is no certain or practical cure, although one option is surgical removal of the nail. Even with that, however, the infection tends to recur eventually. For those not wanting to lose a nail, the laser did produce an improvement, and its use was approved last October. What’s more, a similar approach could be used to treat antibiotic-resistant staph and other infections. These clinical uses show that, for a surgeon, a laser is about more than cutting or removing tissue. In some ways, that isn’t surprising, since the same is true of surgeons themselves.